High density polyethylene pipes (HDPE) are electrical conduits made from graded raw materials such as PE 63, PE 80, and PE 100. These pipes are one of the most premier mediums of conveying and transporting chemicals, water, and gases. One of the major advantages of utilizing HDPE pipes is that they are 6-8 times lighter than conventional cast iron and galvanized iron pipes. In addition, high density polyethylene pipes are non-corrosive in nature, which makes them suitable for water transportation. The advantageous properties of HDPE pipes make them appropriate for numerous applications including flood irrigation, drip irrigation, portable water supply & distribution, sewage & industrial effluent disposal, air-conditioning & refrigeration ducting, electrical installations, and drainage pipes. Owing to the increasing application of HDPE pipes in various end use industries, the market for HDPE pipe is expected to witness substantial growth. The growth in demand from water irrigation systems in agricultural industry is expected to drive the growth of the HDPE pipe market. Rapid urbanization is anticipated to increase the demand for water supply, leading to increase in requirement of HDPE pipes. Furthermore, growth in sewage disposal infrastructure fuels the demand for HDPE pipes. However, volatile raw material prices attributed to fluctuation in prices of crude oil is expected to hamper the market growth. Conversely, innovation and technological advancements in PE pipe provide future growth opportunities to the HDPE pipes market. The global HDPE Pipes market is segmented into type, application, and region. Based on type, the global HDPE pipes market is divided into PE 63, PE 80, and PE 100. Based on application, the market is classified into oil & gas pipe, agricultural irrigation pipe, water supply pipe, sewage system pipe, and others. Based on region, the market is analyzed across North America, Europe, Asia-Pacific, and LAMEA. The key players profiled in the report include JM Eagle Inc., WL Plastics, Lane Enterprises, Inc., Prinsco, Inc., Uponor, Poly plastic group, Mexichem S.A.B. de C.V, United Poly systems, Radius system, and Blue Diamond Industries, LLC. 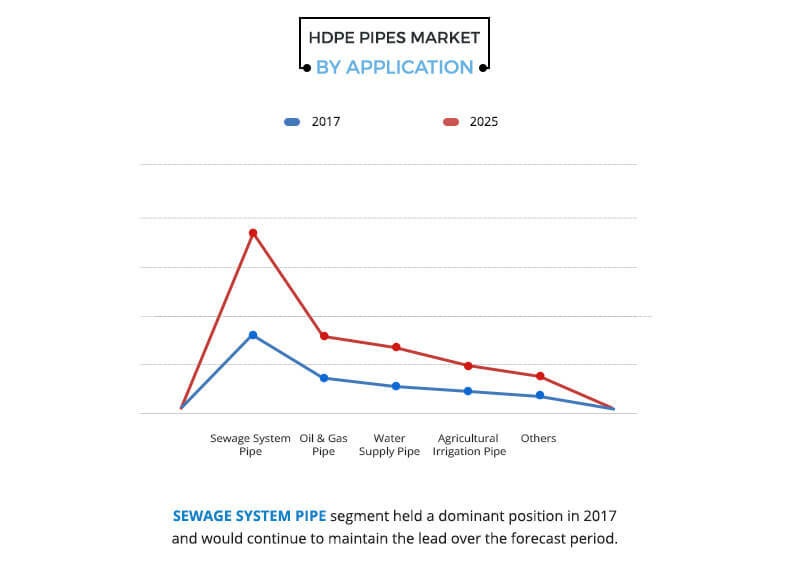 These market players are adopting different strategies such as acquisition, product launch, and merger to stay competitive in the global HDPE pipes market. Other key players include Canada Culvert, Inc. (WGI Westman Group, Inc.), Dura-Line Corp., IPEX Inc., Reliance Industries Limited, and Kanaflex Corporation Co., Ltd.
North America HDPE pipes market is anticipated to witness high growth rate during the forecast period owing to growth in use of HDPE pipes in wide range of in industrial sectors ranging from food packaging, cosmetics to technical parts, and pipes for the construction sector. The PE 63 segment is projected to be the most lucrative segment during the forecast owing to increase in use of PE 63 pipe in drinking water applications. Based on application, the water supply pipe segment is estimated to grow at the highest CAGR during the forecast period. The growth of the segment is attributed to the rise in demand for water infrastructure owing to growth in population. It outlines the current trends and future scenario of the HDPE pipes market from 2017 to 2025 to understand the prevailing opportunities and potential investment pockets. 7.10. BLUE DIAMOND INDUSTRIES, LLC. The global high density polyethylene (HDPE) pipes market has reported a significant growth in the recent times. These pipes use polyethylene as a resin into which colorants, stabilizers, antioxidants, and other ingredients are added for enhancing the strength, toughness, and resistance to chemicals. HDPE pipe formulations yield tough, durable, and strong piping systems. Therefore, these pipes are now being utilized in greater volumes for sewer and drainage projects. There is an increase in the production capacity owing to easy availability of resins. New developments in both raw material and pipe systems demonstrate that high-density polyethylene pipes are reliable and smart choice for various industries, such as oil & gas, sewage, and construction. These industries are anticipated to continue engaging in advancements, which is expected to boost the demand for HDPE pipes in future. The market is influenced by the fluctuation in raw material prices, which affects the prices of crude oil. Moreover, there is a significant increase in the market price, which affects the consumer base. However, new developments and innovation in PE pipes are the factors anticipated to offer growth opportunities to the global HDPE pipes market.